The University of Texas had an alumni baseball game last week, inviting former Longhorns back to campus to play a little ball. But rather than outfitting them in UT uniforms, they have them bring the jerseys of their parent clubs — ostensibly to show off just how cool they are that they have so many former players scattered around the major and minor leagues. But I can’t say I blame them. I’m a big fan of baseball uniforms and designs, and I pitched a fit when Major League Baseball floated the idea of outfitting the All-Star teams in matching uniforms, rather than letting the players each wear their team colors. Thank god that didn’t go through. So while there’s a little arrogance here by the Longhorns, I can’t say I mind it. It’s a nice touch. 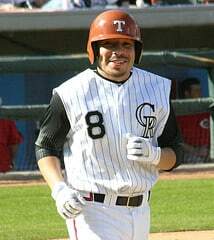 OMG Omar Quintanilla looks like the head of the lollipop guild. I know that he isn’t a Hobbit, but something about that picture makes him look like he’s about 4 feet tall and has a giant blond cowlick hiding underneath that longhorn helmet.